Uberific I Got 3K Credits ~ Philippine Freebies, Promos, Contests and MORE! I wrote about how you can get P1,000 credits simply by referring Uber to new users last January 28, 2014. I just want to give a quick update on how fast those referrals converted. 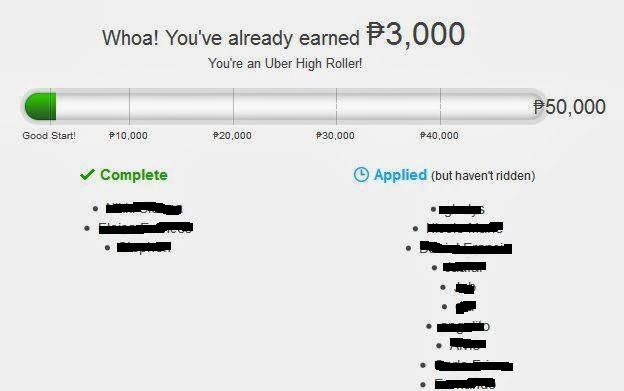 Out of the 20 who applied/registered and got a P1,000 credit each, 3 converted which gave me P3,000 Uber credits or P1,000 per successful referral! Awesome. I think the best part about this is that those I referred did not need to spend in order for me to get a P1,000 referral credit. They simply need to use their P1,000 credit when they registered using my referral link. How awesome is that? Again you can earn up to P50,000 in Uber credits so let's see what happens in the next few weeks or months.